A guineafowl surprised motorists and pedestrians late Sunday afternoon by wandering around the south end of Point Reyes Station’s main street. 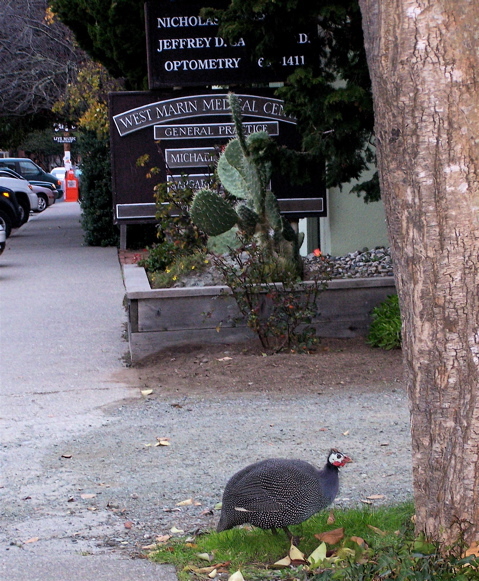 When I first spotted the Helmeted guineafowl, it was pecking on the sidewalk and in the grass between the Coastal Marin Real Estate and West Marin Medical Center buildings. The bird subsequently stopped traffic by standing on the main street for a while. It later paused to reconnoiter while in the middle of the intersection in front of Whale of a Deli. Intrigued by the non-native species, Highway 1 motorists patiently waited until the guineafowl decided which way to go next. One merchant tried to herd it (flock it?) off the roadway but was only temporarily successful. Guineafowl “eat lice, worms, ants, spiders, weeds, ticks etc.,” Wikipedia notes, so having one roaming around town was probably all to the good. The partridge-like bird is native to Africa, so I contacted Jack Long, who raises exotic fowl at Creekside Birds along the levee road not far away. From my photo, Jack was able to confirm the bird is indeed a guineafowl but said it does not belong to him. Jack noted I was the second person to ask whether it was his bird but added that he’d stopped raising guineafowl long ago because they’re so noisy (his birdcages are next to his house). Jack told me he doesn’t know of anyone in town now raising guineafowl. 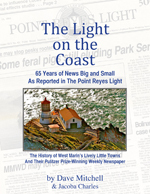 Update as of Tuesday: Neighbor George Stamoulis told me yesterday that he’d just seen a guineafowl at Millerton Point. Neighbor Skip Shannon, a hunter and field-trial competitor, added that hunters sometimes use guineafowl in training their dogs although he doesn’t. And biologist Russell Ridge of Inverness Ridge (“no relation”) told me that anyone who hunts guineafowl better like dark meat. Sparsely Sage and Timely is powered by	WordPress 4.9.10 and delivered to you in 0.318 seconds using 50 queries.